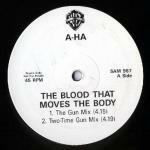 This single is a remix by Alan Tarney of the 1988 version of "The Blood That Moves The Body". The cover of the 7" has a black and white group-shot (Magne, Morten and Pål) by Just Loomis with "brown paper" effect strip across the top with large white and light brown letters "a" and "h". Along the top of the picture the title is written in various colours. The reverse of the sleeve is brown paper effect with a large white "a" and dark red "h" which has the track listings along it in different colours and there is a small colour picture of "Headlines And Deadlines". The tracks on the 7" are two different mixes of the song; "The Gun Mix" (4:15) and "Two-Time Gun Mix" (4:19) respectively. There is a promo edition of thr 7" which comes in the same sleeve as the regular release, but has a white circular "Promotional copy only not for resale" sticker plus a rectangular wea records sticker with contact numbers stuck on the front sleeve. The record itself is identical, but some copies have the A-side label stuck on both sides of the disc. The identically sleeved 12" features the additional track "The Second Gun Around Mix" (5:56). The release of this 12" single marks the end of an era concerning the 12" format. There is also a UK 12" promo which has the same tracks as the regular release, but it comes in a black sleeve without any pictures. The CD has a similar cover to the vinyl release. The spine has the title written in white and yellow on a "brown paper" background. 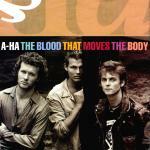 The German made CD is dark red with a silver a-ha-logo and orange titles and features the same tracks as the 12". The cassette single has a sleeve design very similar to the 7" except for the title which has been written in two lines rather than one due to the narrower sleeve. The flap of the insert opens up and is similar to the reverse of the 7" except that the design is rotated so that the "h" is upside down. A picture of the "Headlines and Deadlines"-album is printed at the top. The spine has the "brown paper" effect with the titles printed in different colours as on the front. The black cassette with white titles which features the same tracks as the 7" has one track on each side.